[/tab1] [tab2] Each year the USC Dornsife Spatial Sciences Institute faculty and students participate in the world-wide celebration of GIS Day on November 19th. First organized in 1999, GIS Day is a grassroots global effort by users of geographic information science (GIS) and technology to demonstrate real-world applications that are making a difference in our society. On GIS Day 2017, the USC Spatial course SSCI 301: Maps and Spatial Reasoning presented a talk for the entire USC community by Jayme Laber from NOAA's National Weather Service. Laber, a Senior Service Hydrologist, spoke on the current uses of GIS and geospatial data to track, forecast, and issue warnings for weather related events. He shared new and exciting data viewers for weather and hazards, as well as new satellite systems with greater spectral data collection capabilities and higher resolution. For the 2015 GIS Day, the USC Spatial course SSCI 165: Sustainability Science in the City featured Natalia Gaerlan, Diana Silva, and Edna Robidas of The Trust for Public Land speaking about "Using Spatial Analysis to Maximize the Impact of Multi-Benefit Projects," with a field visit to the nearby Avalon Alleys. On GIS Day 2014, USC Archaeology, GeoDesign, and Spatial Studies students demonstrated field applications of geospatial science and technology in archaeological excavations. They learned how remote sensing, aerial imagery, and GPS systems are helping archaeologist in Guatemala uncover ruins of ancient civilizations. View gallery. For the 2013 GIS Day celebration, the Spatial Sciences Institute held an information session on the B.S. 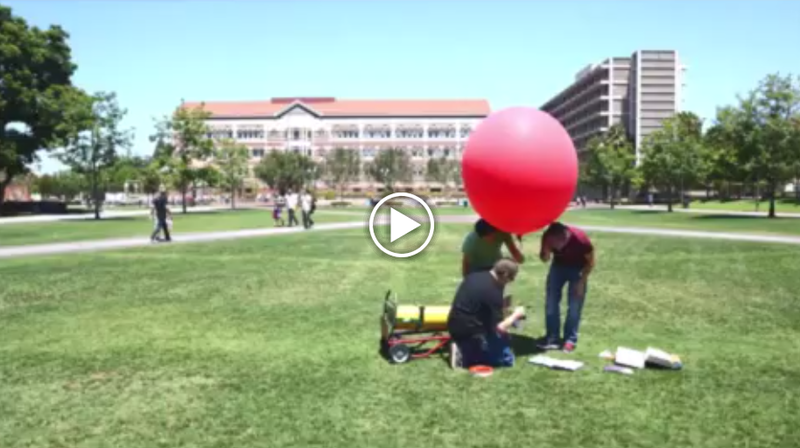 in GeoDesign major, followed by a demonstration by spatial sciences undergraduates in SSCI 301: Maps and Spatial Reasoning of the ability to capture aerial data from a mapping balloon. The Spatial Sciences Institute balloon is registered with Public Lab, a citizen science group that shares research ideas and experiments. The balloon is a weather balloon equipped with a GoPro camera mounted and attached to the balloon base, which captures aerial imagery of a study area. The imagery can then be downloaded and “stitched” together to provide a full mosaic of the study area under investigation. The temporal resolution of the mapping technology provides immediate surveillance of an area, which can then be used for a spatially-informed response plan, such as in areas affected by natural and other disasters. View Gallery. The Spatial Sciences Institute joins other organizations in presenting GIS Day activities, including Esri, the National Geographic Society, the Association of American Geographers, the American Congress on Surveying & Mapping (ACSM), the American Geographical Society, the American Planning Association, the Center for International Earth Science Information Network (CIESIN), the Geospatial Information & Technology Association (GITA), Hewlett-Packard, the National Center for Geographic Information and Analysis (NCGIA), the National Council for Geographic Education (NCGE), the National States Geographic Information Council, the Open Geospatial Consortium (OGC), Sun Microsystems, the Urban and Regional Information Systems Association (URISA), the University Consortium for Geographic Information Science (UCGIS), the US Geological Survey, The Library of Congress, the Map and Geography Round Table (MAGERT) of the American Library Association, The Nature Conservancy, the Wildlife Conservation Society, and the World Wildlife Fund. [/tab2] [tab3] USC Spatial Sciences Institute majors and minors have the opportunity to present papers, posters, and network with industry professionals at the Institute's annual Los Angeles Geospatial Summit. This one-day event held each year in February features speakers and presentations on trends and innovative projects spanning fundamental spatial science, geospatial technologies, and applications. A consortium of GIS academic programs throughout Southern California collaborates to provide a unique opportunity for GeoDesign students to be a part of the GIS and geospatial community. Save the date for the Friday, February 22, 2019 Los Angeles Geospatial Summit at the USC Radisson Hotel, adjacent to the USC University Park campus. [/tab3] [tab4]Learn what it's like to be part of a global community of practice in Geodesign at the annual Esri Geodesign Summit held at the Esri headquarters in Redlands. Join USC Spatial Sciences Institute faculty in attending the 2019 Esri Geodesign Summit on Monday, February 25 - Wednesday, February 28, 2019. Watch Bill Miller, the founder of Esri GeoDesign Services, talk about "GeoDesign Philosophy, Theory, and Methods" at the 2012 Esri Geodesign Summit. Students also are encouraged to attend the Esri User Conference in San Diego in July each year. The Spatial Sciences Institute hosts a booth and a networking reception at the Esri User Conference, and cordially invites alumni and graduate and undergraduate students to come by both venues.